The TI Innovator Hub™ is the centerpiece of the TI-Innovator™ System, a project kit that extends the functionality of Texas Instruments (TI) graphing calculators to make coding and engineering design accessible to students in the classroom. This document offers quick and easy access to all of the Hub functions and is a suitable template for Lua authors seeking to implement the Hub in their teaching and learning. This document also supports the TI-Nspire iPad app with BlueTooth 4.0 (BLE) devices, including Vernier Go Temp and GoLink, TI CC2650 SensorTag and TI LaunchPads. This document offers three probability simulation activities: dice throw, coin toss and spinner. For each simulation, three activities are available: a single run, a fast run (10 repetitions) and a very fast run (50 repetitions). Data from each trial is stored in lists which are then available for display and analysis using TI-Nspire tools. The Lua Objects Gallery offers a toolkit for common objects used in Lua scripts. Now, instead of having to define your own buttons, sliders, and other such objects, you can copy and paste the code and use those provided here. 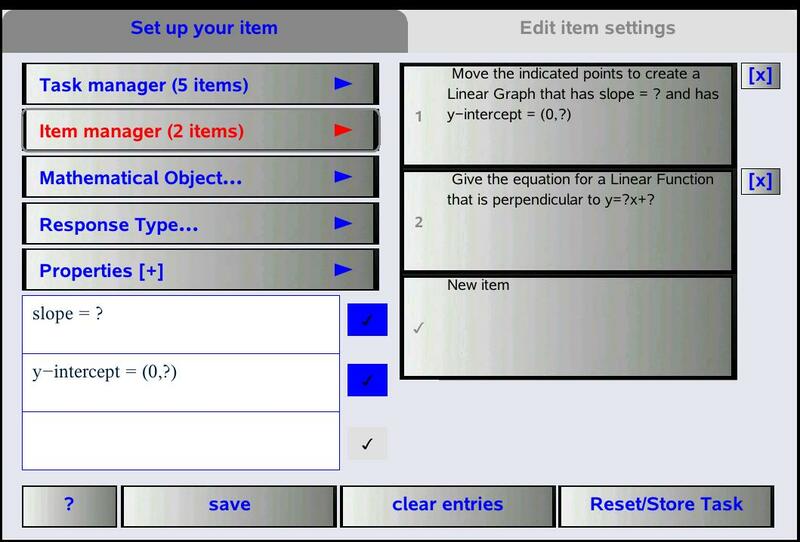 The objects include: buttons, clickers, sliders, dropdown menus, checkBoxes, text boxes, play/reset controls, help windows, and even a graphing grid and timer. If you have not yet heard about the amazing TI SensorTag, then you really should have a look! So many powerful tools for learning and exploration packed into one tiny, robust and inexpensive package! 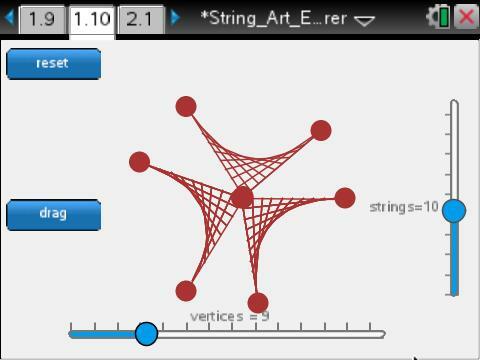 The Lua Objects Gallery has now been enhanced to take advantage of the SensorTag if you have one: now you can control your Lua Objects remotely using the SensorTag if you are using the TI-Nspire iPad Apps. 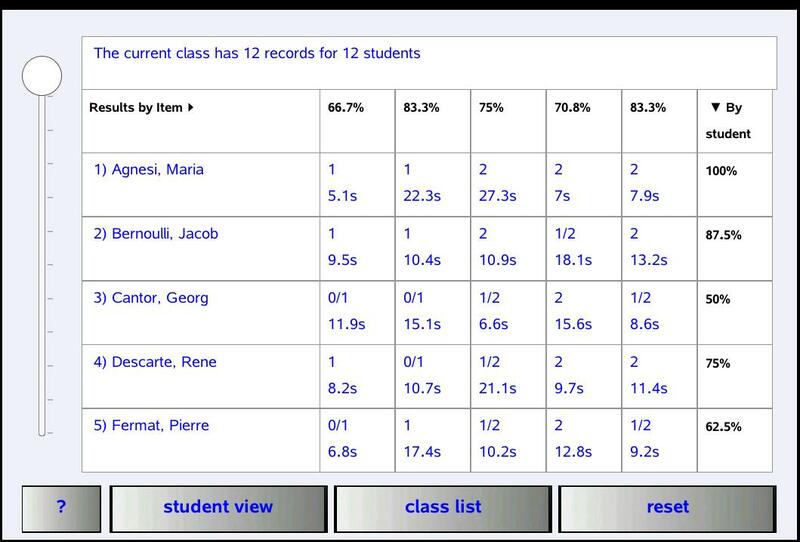 Looking for a quick and easy way to share data and student responses around the classroom? This useful document allows students to enter responses or data and converts this to a QR Code. If you are using the TI-Nspire App for iPad, then you can easily read these responses, or use a free QR Reader to read and copy them. Students may use this method to share data with each other. You can even use Google Drive to collect student responses into an online spreadsheet that you as the teacher can access and have it populate LIVE as your students send their responses! For step-by-step instructions, visit the QR Coder page. The TI CC2650 SensorTag offers amazing opportunities for mathematics and science STEM classroom applications. For less than $USD30 this device literally puts real world data collection in the palm of your hand. 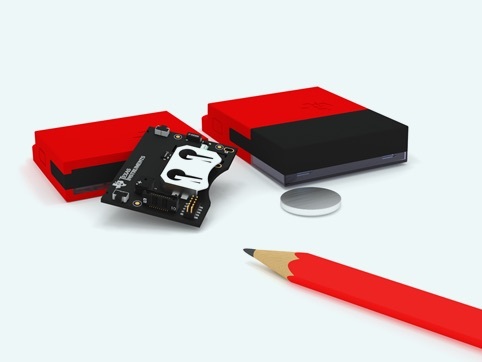 Temperature (both ambient and IR), humidity, barometric pressure, acceleration, magnetometer, gyroscope and (in the case of the new SensorTag 2.0) light intensity - a powerful range of learning opportunities in a tiny, simple device. Using the TI-Nspire iPad Apps with this document, students and teachers may quickly and easily capture data, display and store for further analysis - AND (using free Apps for iPad and Android) send their data to the cloud for sharing! Problems come in all shapes and sizes, but rarely in the form of a ready-made symbolic function, which is the way in which most mathematics technology expects you to enter to get started. Instead, problems more commonly come in the form of diagrams, graphs, words, and increasingly in the form of data, which needs to be visualized and analyzed. Wouldn't it be great if we had a quick and easy way in which to access the many powerful and useful features of TI-Nspire at the click of a button? Wouldn't it be great if you could just enter implicit equations, or expressions involving variables that would automatically generate sliders? And if you could do all of this, whether you are using CAS or numeric Nspire? Wouldn't it be great if you could just call on existing data sets, or quickly and easily create your own by entering values directly into a table, or just by clicking on a grid? 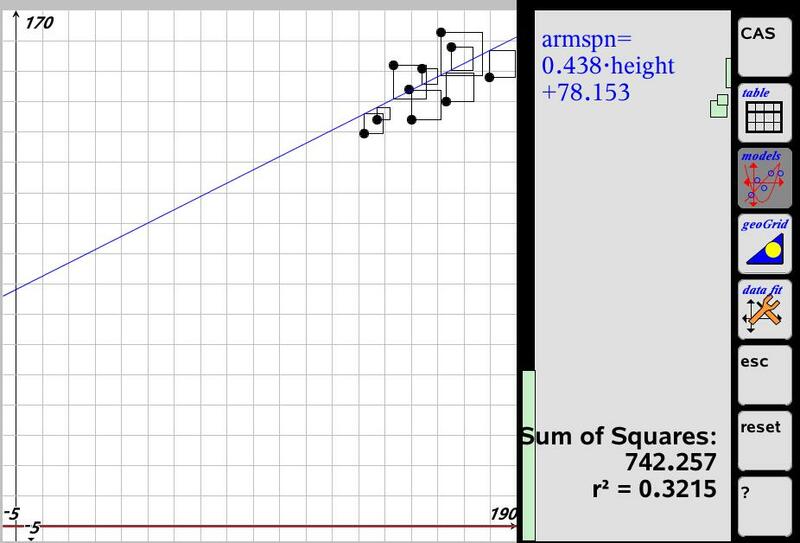 Then to be able to zoom to fit with a single click, and explore different regression models - all with the click of a button? 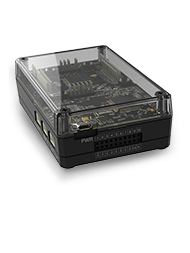 Explore the various features of this Lua-based enhancement of the TI-Nspire platform. This document has been optimized for handheld, iPad, computer and Player. 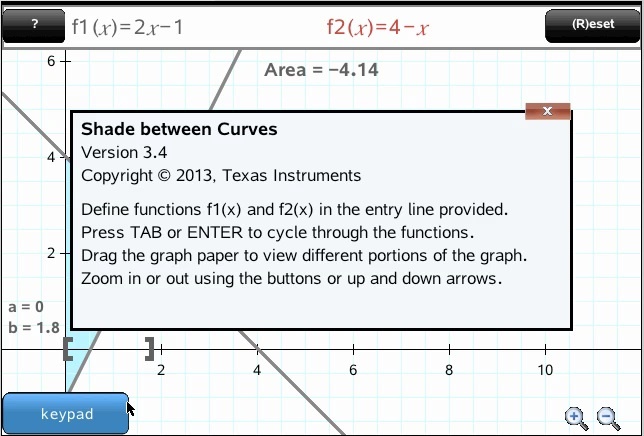 Exploring Functions makes it easy to build a range of question types that establish firm foundations for understanding functions and their graphs. The document can be used in exploration mode, with all feedback and scaffolding available, or the degree of support and feedback can be easily controlled by the teacher. A complete record is kept of student interactions, available for the teacher to access on collecting the students document. In addition to the TEI_Functions document, the classroom utilities documents linked here offer support for the classroom "round trip" - sending and retrieval of created task documents. Once the teacher creates a TEI document with one or more tasks, this needs to be made available to students and, once completed by them, needs to be retrieved and processed for analysis. If using Navigator, the initial student document is automatically duplicated for each student in the class, and easily sent and called back. However, the completed (portfolio) documents need to then be processed for TEI analysis. The TEI_Nav_Renamer utilities for OS X and Windows request the teacher to locate the portfolio folder and then to point to a destination folder (usually this will be the MyLib folder in Documents > TI-Nspire). For non-Navigator classrooms, student documents may be made available via a shared folder (Google Drive, DropBox, Box, or some other medium). The TEI_Duplicator utilities for OS X and Windows request the teacher to provide a class list document (in CSV format), a student file to be duplicated and a destination folder for the class test files. The initial student test document is duplicated for each member in the class and dropped in the shared folder specified. Students complete the file with their name, and it is ready for immediate analysis by the teacher once saved. Note: Please be patient - this one may take up to two minutes to load. 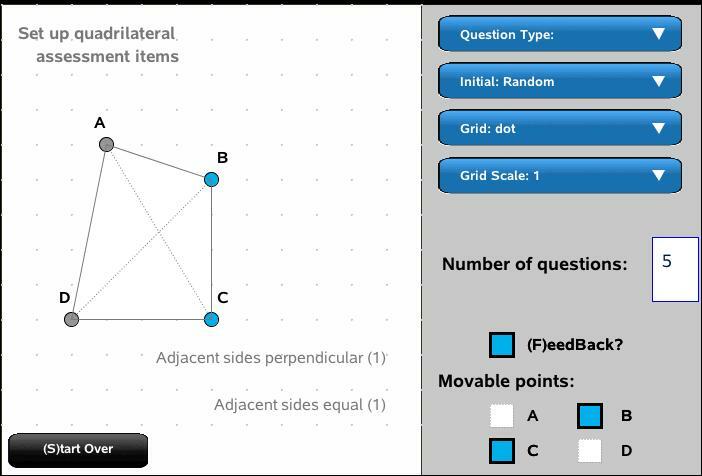 Exploring Quadrilaterals offers students opportunities to build solid links between the visual shape and the properties for each of the common quadrilateral types. This Technology Enhanced Assessment document further provides a toolkit for teachers to customize and create their own exploration and/or assessment documents for their students. Teachers control question type, initial placement, grid type and scale, whether feedback is provided and which points are movable or locked. A complete record is kept of student interactions, available for the teacher to access on collecting the students document. Drag the pattern blocks to build and explore addition and subtraction of fractions. Begin with a game - see in how many different ways you can build a given fraction. Then proceed to the challenge - three different levels with varying degrees of support and difficulty. 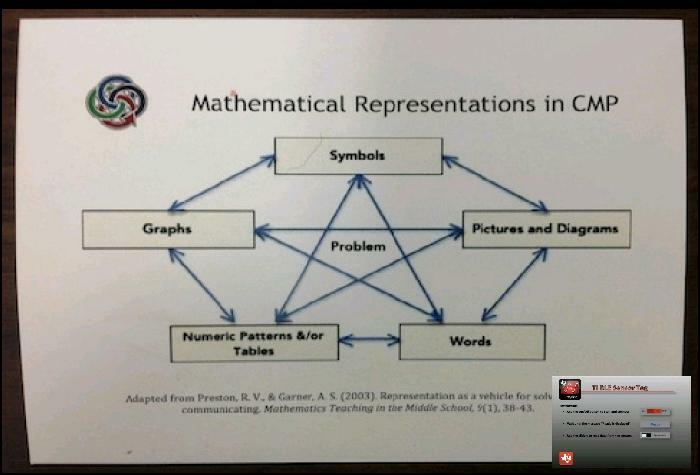 You are offered a mix of word problems and the more usual fraction questions. Student interactions are tracked and available for review. 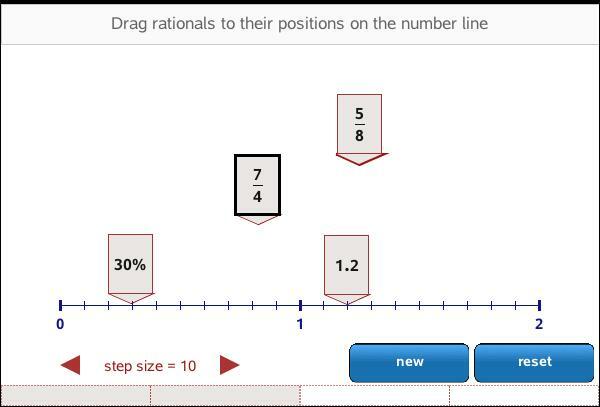 Drag the rational number blocks to their correct positions on the number line. Watch for the feedback to indicate that you have it right. Use the spreadsheet to enter your own rational numbers (as "strings") or press "New" to generate random ones. A record is kept of the interactions. Switch to "test mode" and delete the test mode window and the spreadsheet page (ctrl-k) and you now have a suitable assessment document. A key stumbling block for students learning algebra often may be found in their ability to recognise like and unlike terms in an algebraic expression or equation. 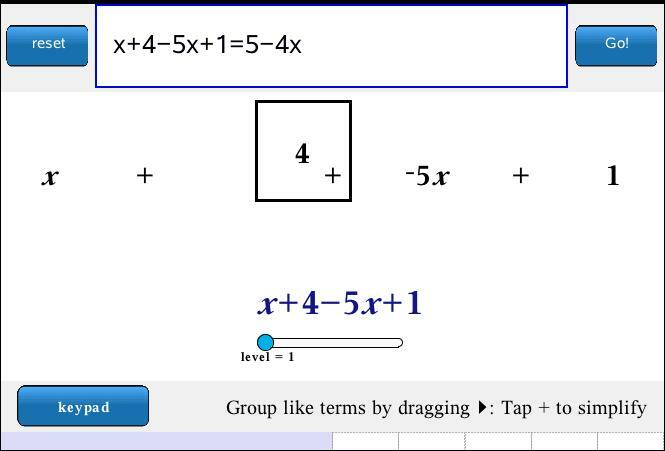 In this dynamic exploration environment, students may enter their own expressions (polynomials in x) or simply click the "Go!" button to generate random expressions of mixed terms. Like terms may be grouped by dragging, and then simplified by clicking the "+" sign between them. 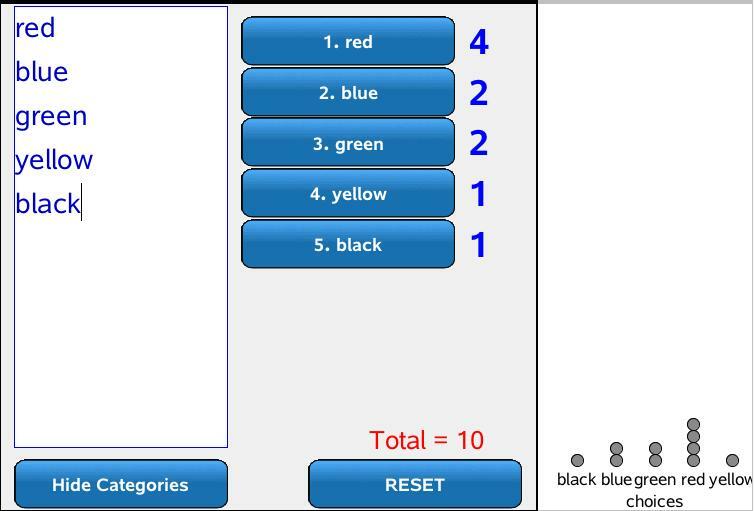 This tool makes it easy to set up your own categories and then simply tap on buttons to record experimental results. These are automatically displayed using spreadsheet and plots. Explore information about all 254 nations of the world (as at 2010) Study population, geographic and lifestyle data, compare nations, and search using a wide variety of criteria. This document has been optimized for both handheld (using keyboard control - just press arrow keys to control the action - no need to grab anything!) 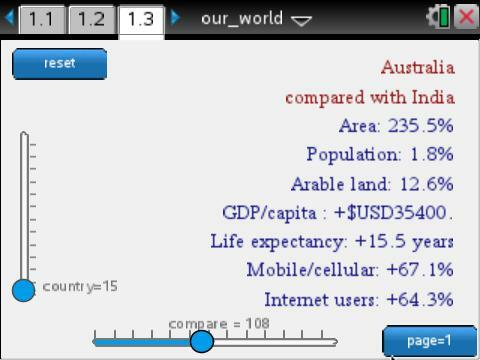 and also for iPad, computer and Player (using mouse control - just grab and drag the control points - horizontally to change the comparison country, up and down to set the focus nation). 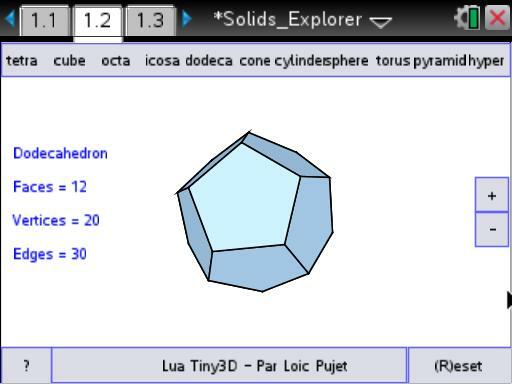 Explore common 3D solids, from the Platonic Solids to the hypercube! There are five Platonic solids - regular convex polyhedra. Four of them have a "dual" - a close relationship with another. Which ones? Euler's Theorem relates the number of vertices, faces and edges. Can you find it? Rotate just by moving the mouse in the central region of the screen. A simple utility supporting shading between two curves. Enter and control using either keyboard or keyPad. 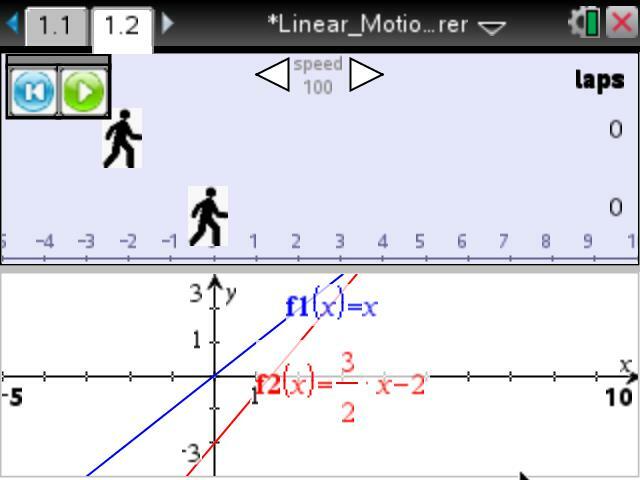 Build deep understanding of slope and y-intercept as students control the motion of objects - in this case, the runners in a race. 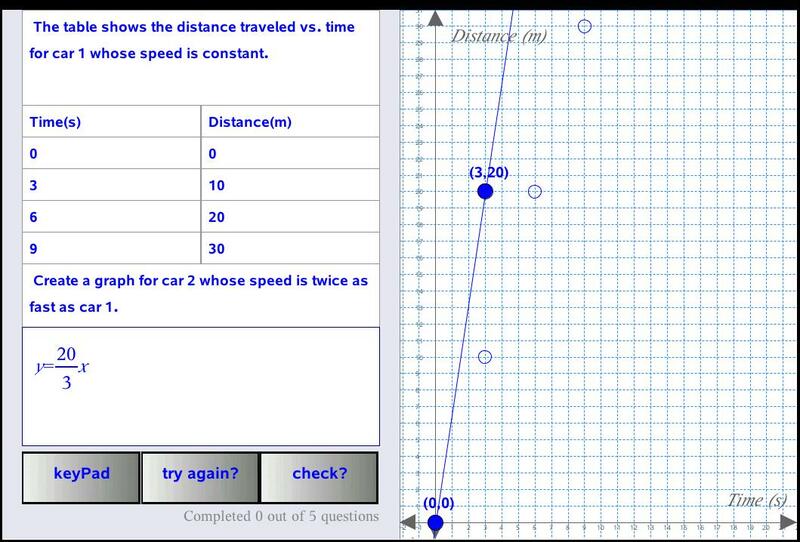 Drag the function graphs around to control the motion of the runners - change y-intercepts to set the race up. 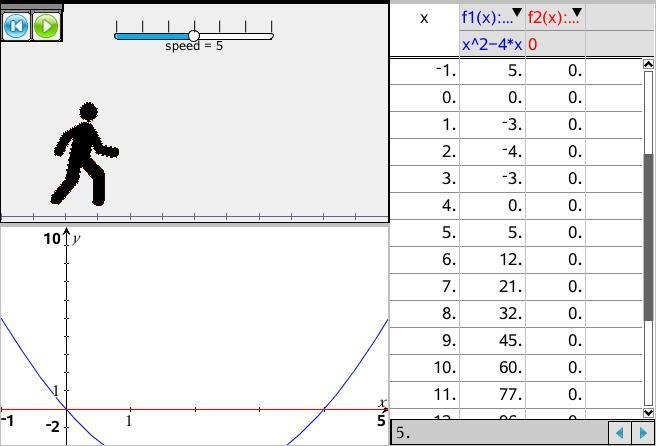 Then change the slope of the functions and see the immediate change in the speed of the runners. Add up to four runners. An essential part of building strong foundations for algebra in the early years of high school is effective use of concrete manipulatives. Carefully introduced, algebra tiles serve to give students a referent which helps them to make sense of the symbols and manipulations which otherwise may well remain meaningless. 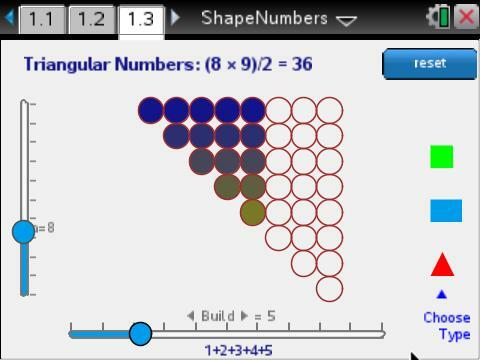 Virtual manipulatives until now have been slow and difficult to use, but Lua offers the chance for students to use these tools easily. 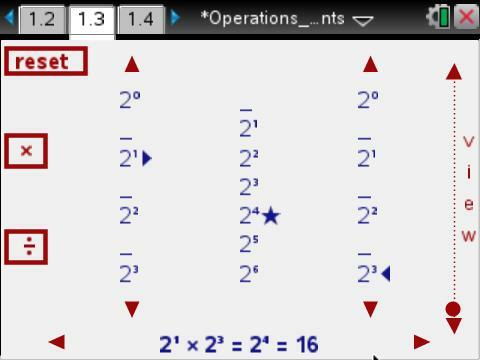 Click and drag with the mouse, or press "s", "x", "1" or even "-x", "-1" etc to select, then watch the selected tile jump to the mouse position, easily building algebraic expressions. Rotate the x-tiles by clicking on either end, or by pressing "r". The algebraic object is then picked up on the work page and appropriate actions become available, including a step-by-step checker. 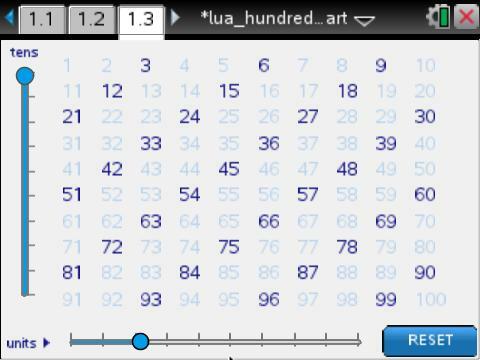 Use left and right arrows to move horizontally and up and down to move in jumps of 10 - study the patterns of factors formed by the different numbers on the hundreds chart. This document has been optimized for both handheld (using keyboard control - just press arrow keys to control the action - no need to grab anything!) and also for iPad, computer and Player (using mouse control - just grab and drag the control points - horizontally to increase and decrease the vertex number, up and down to change the number of strings). 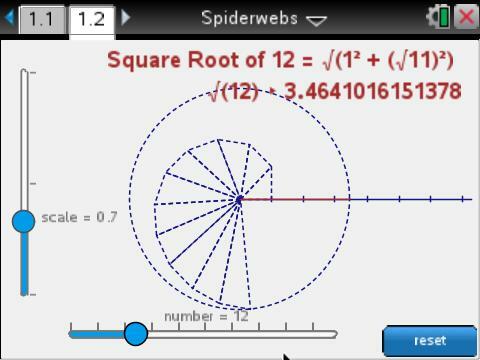 Build a spiderweb using successive triangles to build the irrational square roots of numbers. See these positioned on the number line. This document has been optimized for both handheld (using keyboard control - just press arrow keys to control the action - no need to grab anything!) and also for iPad, computer and Player (using mouse control - just grab and drag the control point - horizontally to increase and decrease the number value, up and down to change the scale). This document has been optimized for both handheld (using keyboard control - just press arrow keys to control the action - no need to grab anything!) 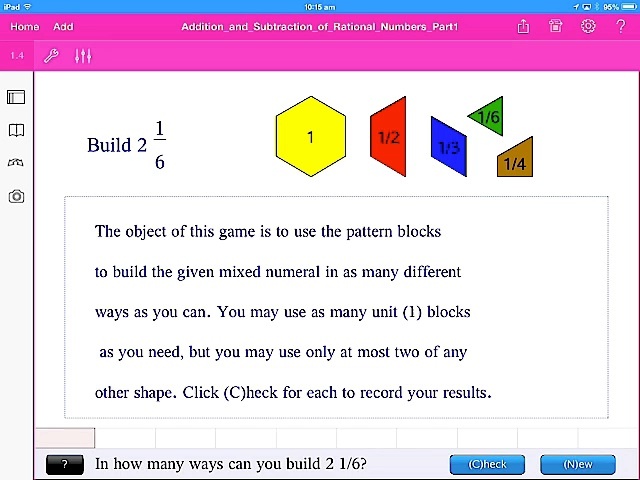 and also for iPad, computer and Player (using mouse control - just grab and drag the control point - horizontally to increase and decrease the number value, up and down to build the pattern). 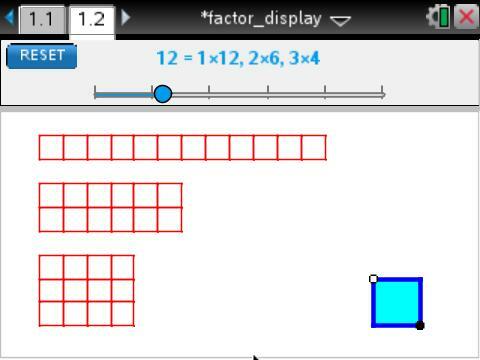 Visually explore the factors of counting numbers. This document has been optimized for both handheld (using keyboard control - just press arrow keys to control the action - no need to grab anything!) 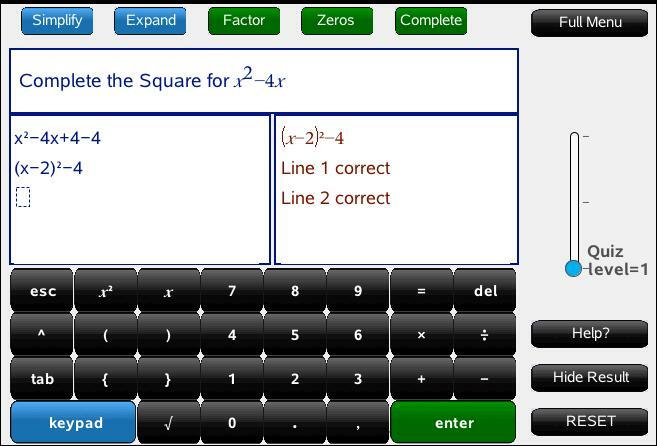 and also for iPad, computer and Player (using mouse control - just grab and drag the control points - horizontally to change the number value). 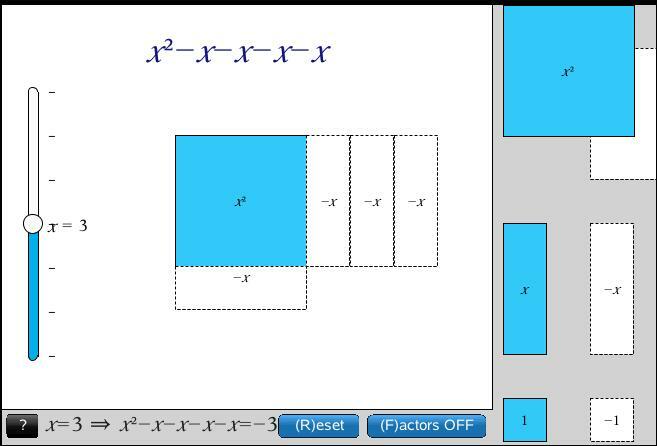 Learn to multiply and divide numbers with exponents using the patterns in this interactive table. This document has been optimized for both handheld (using keyboard control - just press arrow keys to control the action - no need to grab anything!) and also for iPad, computer and Player (using mouse control - just grab and drag the control points - horizontally to increase and decrease the base number, up and down to change the index values). 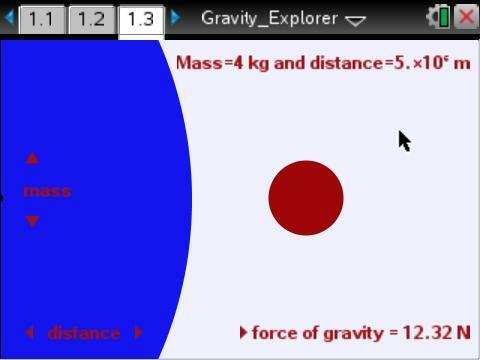 Vary mass and distance between planetary objects, then use data on the planets to calculate the gravitational attraction between each and the Earth. What would it be like to live on Mars? Or Jupiter? 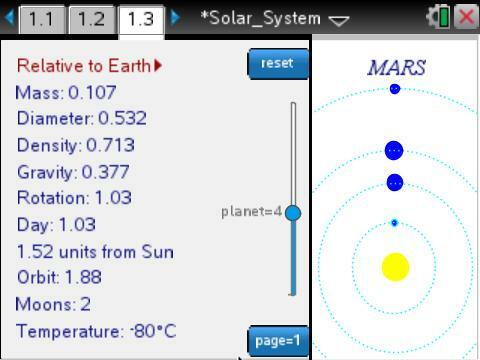 Explore information about the planets of our solar system, and compare their conditions with those of our own planet. This document has been optimized for both handheld (using keyboard control - just press arrow keys to control the action - no need to grab anything!) and also for iPad, computer and Player (using mouse control - just grab and drag the control points - horizontally to change the page, up and down to change planets). Explore the effects of changes to the permeability of a membrane on the movement of random particles. This document has been optimized for both handheld (using keyboard control - just press arrow keys to control the action - no need to grab anything!) 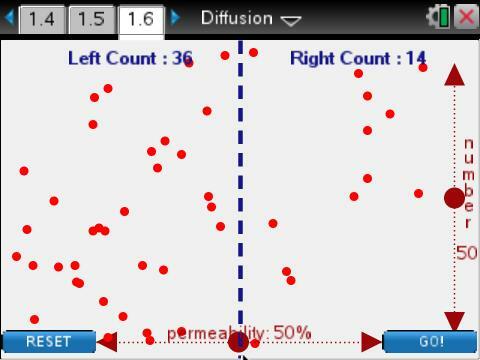 and also for iPad, computer and Player (using mouse control - just grab and drag the control point - horizontally to increase and decrease the permeability, up and down to change the number of particles). 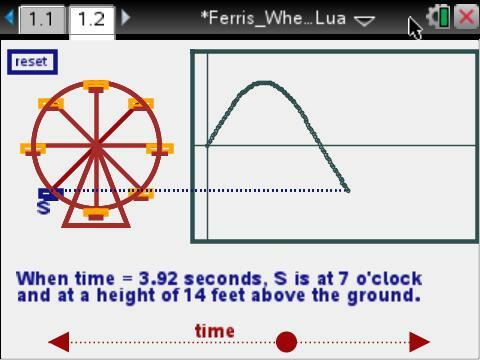 Drag the slider to make the ferris wheel turn, and see the values for height above the ground along the way. 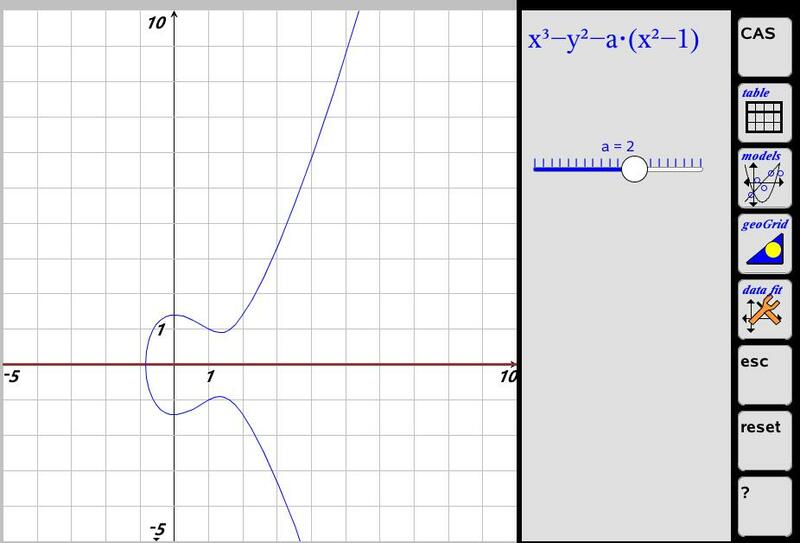 This document is a nice exemplar for creating your own axes and graph using Lua graphics. Compete in the hammer throw! 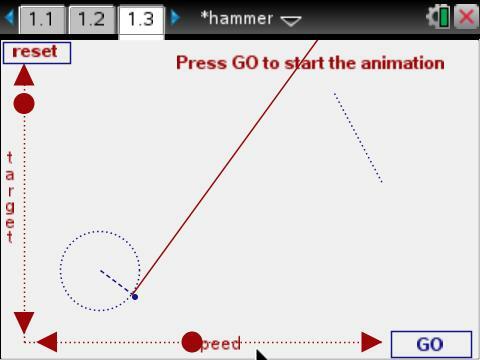 Press enter at the right point to release the hammer so that it passes through the target. Use arrow keys to increase or decrease the level of difficulty, and to slow down or speed up the turn. This document has been optimized for both handheld (using keyboard control - just press arrow keys to control the action - no need to grab anything!) and also for iPad, computer and Player (using mouse control - just grab and drag the control point - horizontally to increase and decrease the speed of the turn, up and down to change the size of the target).